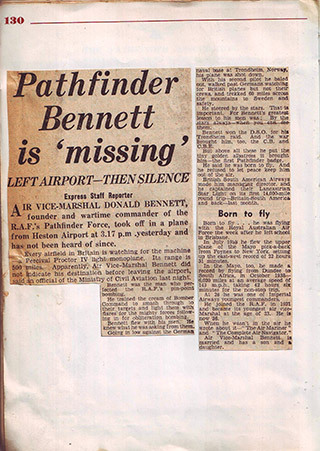 Air Vice-Marshall Donald Bennett, founder and wartime commander of the RAFs Pathfinder Force, took off in a plane from Heston Airport at 3.17 pm yesterday and has not been heard of since. Every airfield in Britain is watching for the machine – a Percival Proctor IV light monoplane. Its range is 500 miles. Apparently, Air Vice Marshal Bennett did not indicate his destination before leaving the airport, said an official of the Ministry of Civil Aviation last night. Bennett was the man who perfected the RAF’s pinpoint bombing. 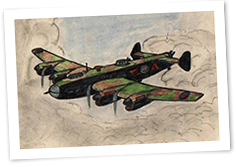 He trained the cream of Bomber Command to smash through to their targets and light them with flares for the mighty forces following in for obliteration bombing. 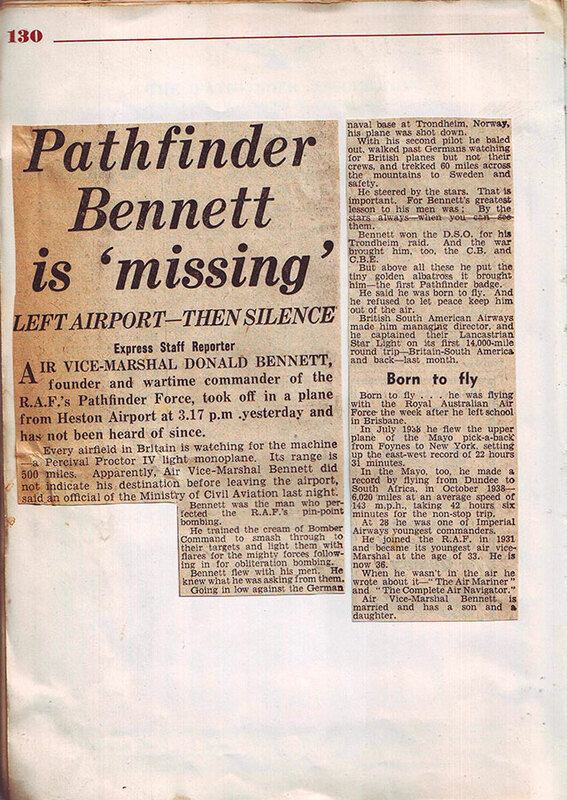 Bennett flew with his men. He knew what he was asking from them. Going in low against the German naval base at Trondheim, Norway, his plane was shot down. With his second pilot he baled out, walked past Germans watching for British planes but not their crews, and trekked 60 miles across the mountains to Sweden and safety. He steered by the stars. That is important. For Bennett’s greatest lesson to his men was: by the stars always – when you can see them. Bennett won the DSO for his Trondheim raid. And the war brought him too, the CB and CBE. But above all these he put the tiny golden albatross it brought him – the first Pathfinder badge. He said he was born to fly. And he refused to let peace keep him out of the air. British South American Airways made him Managing Director and he captained their Lancastrian Star Light on its first 14,000 mile round trip, Britain – South America and back, last month. Born to fly… he was flying with the Royal Australian Air Force the week after he left school in Brisbane. In June 1938 he flew the upper plane of the Mayo pick-a-back from Foynes to New York setting up the east-west record of 22 hours 31 minutes. In the Mayo, too, he made a record by flying from Dundee to South Africa, in October 1938 – the 6,020 miles at an average speed of 143 mph taking 42 hours six minutes for the non-stop trip. At 28 he was one of Imperial Airways youngest commanders. He joined the RAF in 1931 and became its youngest air vice-Marshal at the age of 33. He is now 36. When he wasn’t in the air, he wrote about it – “The Air Mariner” and “ The Complete Air Navigator”. Air Vice-Marshall Bennett is married and has a son and a daughter.